I was introduced to gomasio about the time I was introduced to Macrobiotics - a Japanese philosophy that, among its many food-related principles, extols the virtues of sesame salt, not least for what it claims are its natural healing properties. Well, the Macrobiotics didn't stick (although there are some good basic tenets there), but the gomasio sure did. Gomasio is one flavor powerhouse. Used as a replacement for salt on whole grains (it's very good on rice), soups, stews, and vegetables, it's a delicious way to reduce sodium while adding a little calcium, magnesium, iron, protein, and fiber. Note: The photo above is a juxtaposition of my raw, unhulled, unroasted seeds on the left, and my toasted, ground seeds on the right. 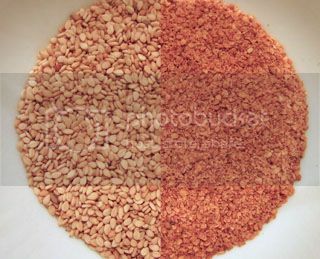 Gomasio is made by grinding dry-roasted sesame seeds with salt. You can purchase it prepared, but it's easy to make, and the fresh-roasted sesame seed taste isn't something you're likely to find in a jar that has been sitting on a grocery store shelf for god knows how long. "[Sesame seed oil] is remarkable for its resistance to oxidation and rancidity, which results from high levels of antioxidant phenolic compounds (lignans), some vitamin E, and products of the browning reactions that occur during the more thorough roasting." From what I can tell, sesame seeds aren't chock full of vitamin E, not like an almond. Maybe there's enough there to supply a little seed's needs, if not the needs of a 100 kg human male. One nutrient they are chock full of is calcium - 60 mg in just 2 teaspoons! 1 Place seeds (any color - black, brown, red, yellow, tan, ivory, etc.) in a clean, dry, frying pan and toast on low heat, stirring often, until golden or until they start to pop - try to pull them off the heat before popping takes place. Note: I used the lowest setting on my gas hob. My seeds toasted in 20 minutes. Many recipes claim they'll toast in 5 minutes, but I suspect they're using higher heat. The longer, lower-temp toasting will result in more even heat distribution, more even browning, and a more potent roasted flavor (since more seeds will have undergone browning reactions). 2 Allow the seeds to cool for about 10 minutes, then place in a small electric grinder with the salt and pulse a few times until most of the seeds are cracked open. Be careful not to grind to a flour consistency; you want some of the texture of the seed to remain. Note: Change any quantities you like. 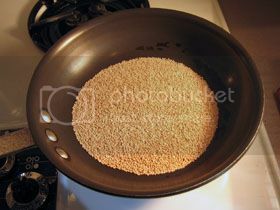 The typical ratio is 8 parts sesame seeds to 1 part salt, but you can use less or even no salt if you prefer. The technique for making gomasio shown above is convenient and time-saving. The traditional method (learned from my Macrobiotic days) involves toasting the salt, preferably a fine grain sea salt, until it shines; letting the salt cool; then grinding it by hand with a Janapese mortar and pestle (suribachi). The seeds are roasted in the same manner as above, but then ground in the mortar with the salt until most of the seeds have cracked open. Ovo je divno, meni je Gomasi predstavila moja drugarica Dusica. Ukusno i zdravo! Watch out for doing that with flax- the flax seeds transform from a nourishing food into a toxic one once they have been heated. Exactly. Please do not use flax seeds in this recipe, as the fragile Omega 3 oils will become rancid and create free radicals when heated. Flax oil should NEVER be heated. Can't wait to try it with the sesame seeds, though. I heard somewhere that you can add arame as well, but can't seem to find a recipe. Are you familiar with this? I have attended many Zen Retreats and use Gomasio instead of salt at the retreat. Starting today, I will use Gomasio instead of plain salt when I am outside of my retreats. Thank you for the recipe! You're welcome. This has to be my favorite condiment. I use it every day. Sometimes I toast it a little too long but I love that dark roasted flavor. "Watch out for doing that with flax- the flax seeds transform from a nourishing food into a toxic one once they have been heated." No reason given, no citations listed = low credibility. Why would flax suddenly become "toxic" when heated?? It never occurred to me to add garlic. Do you mean as a fresh clove? Or a dried spice? Getting the garlic flavor in there wouldn't be a bad idea. I read carefully what you do not heat flax seed. I use ground flax seed + water to replace eggs in recipes for cakes that are baked. It is safe to eat that? Should I worry? Thanks! Ground flax + water ... what a great idea. Thank you for this recipe. I am a true salt alcoholic and I have been looking for something to help me get pass the withdraw, this might be the answer. You can also make a version with seaweed products (kombu, dulce, and nori). I've read that sea salt does not have iodine and the seaweed provides the iodine. Eden Organic makes a Seaweed Gomasio. Yes Gomasio is all the rage, I use it as a condiment for spinach and its Fantastic. About using Flax seeds, heating flax seeds, well I usually have crushed flax seeds in my refrigerator and add a heaping teaspoon to my oatmeal while cooking- This is the first time I hear is bad to heat the flax! This post sure is an oldie but goodie. I don't know what others are referring to about heating causing toxicity. I do know that when you heat a food like seeds that contain fat, the fat (some of it) oxidizes or turns rancid. Oxidized fats cause problems especially when eaten in large quantities. I eat gomasio every day. and I won't be afraid to heat my flax meal anymore. Straight up flax oil, though, is a different story. I've found to my dismay that it will go bad even in the fridge if kept too long (and too long didn't turn out to be very long. Must be some protective effect hidden in the fiber (speculation). You can tell the oil's turned when it gets a sharp scent or flavor, but watch out it's not just the residue around the neck of the bottle. Try including a modest amount of dried chives or, better yet, garlic chives when grinding the gomasio. I am a 6+ year vegetarian still struggling with my love of bacon...I used to work in a veggie restaurant that served gomasio, lettuce and tomato sammies (GLT!!) and I grab the skillet and toast me up some sesame seeds whenever the sweet memories of the time that bacon and I had together come calling. It's really strange how much this stuff does taste like bacon!! No way, you think it tastes like bacon? Weird ... I do too. Reading First magazine, suggests using Seaweed Gomasio for sluggish Thyroid. Just made my first batch, used your recipe and added 2 sheets of Nori and a tsp Garlic Powder. Smells Great can't wait to try it! I used to take a sheet of Nori and whiz it in my spice grinder and sprinkle the flakes on rice. I haven't done that in a while. Now that you mention it ... Think I'll buy some tomorrow. "gomasio, lettuce and tomato sammies (GLT!!)" oh... I'm going to have to try that! Great post & interesting commentary about other ingredients to add to a gomasio. Can't wait to try them out once I've finished my shop-bought one. I have just made my first granola and added dark flax seeds and load of omega 3 foodies. Have I messed up then? Perhaps the toxic comment on flax has to do with linmarin; a cyanogenic glucoside found in flax seed. Upon exposure to enzymes and gut flora in the human intestine, linamarin and its methylated relative lotaustralin can decompose to the toxic chemical hydrogen cyanide. When pressed from poor quality seed, significant amounts of cyanide can be found in flax oil, with a faint bitter almond-like odor from hydrogen cyanide.